It’s a Utica Thing! That’s what all the local people say here. I grew up in Utica NY located smack dab in the center of NY. One thing that is great about living in Utica we have a pizzeria on almost every single corner and lots of Italian restaurants and bakeries. We actually have an annual Chicken Riggie contest where all the local restaurants compete to see who makes the very best. So When it comes to Chicken Riggies we take it very seriously! 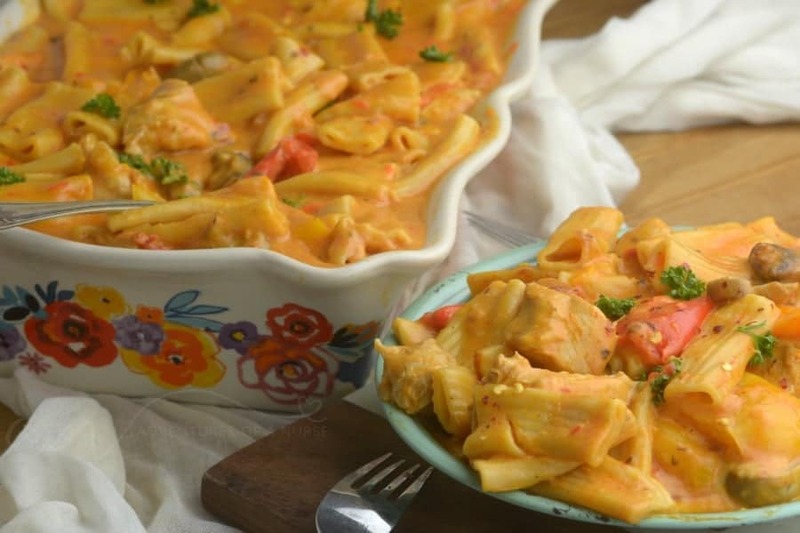 I wanted to bring all my readers a little taste of Riggies with my Instant Pot Utica Chicken Riggies. When I make Chicken Riggies on the stove top I do it slightly different using the homemade marinara sauce and homemade Alfredo with fresh Romano cheese. 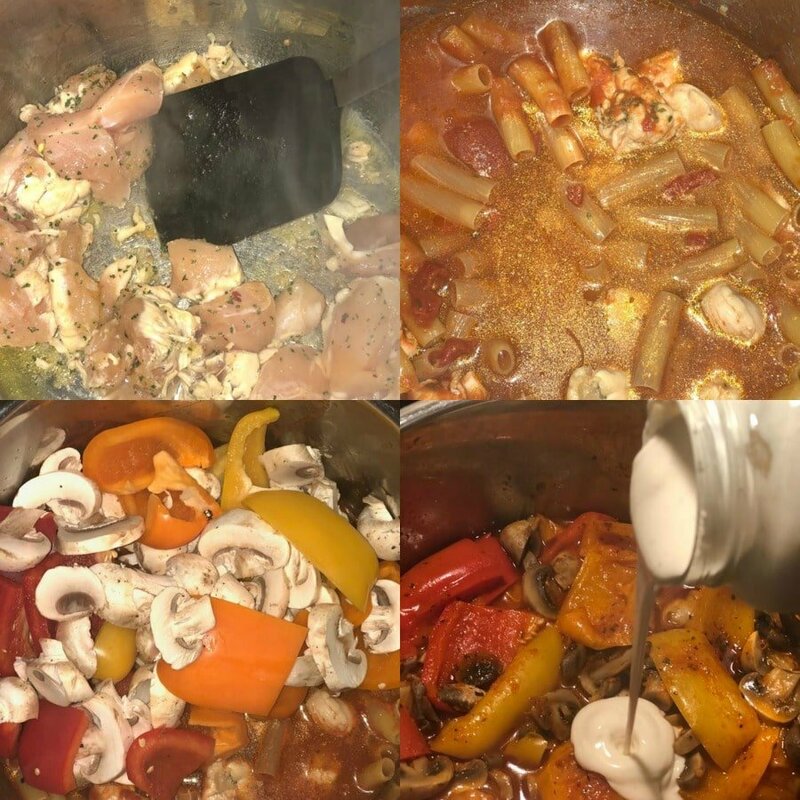 There is really nothing like it but I think I came close to a Quick taste of Utica with my Instant Pot Utica Chicken Riggies. 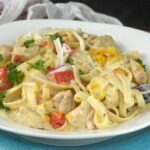 Chicken Riggies has Tender Chicken and a Creamy Cheese sauce, Sweet Peppers, and a Spicy Hot kick of Red Cherry Peppers. The taste of the two sauces mixed with the hot is mouthwatering. 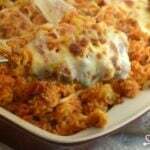 I wanted to find a quick chicken dish that would bring the taste of Utica without taking all day to cook. 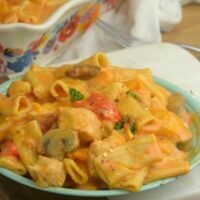 I think I came pretty close with this Instant Pot Utica Chicken Riggies All done in under 15 minutes you get an authentic Utica Chicken Riggies Dish that your whole family will love. The good thing about this is you can use Jarred Sauces or use your homemade for an even better taste. 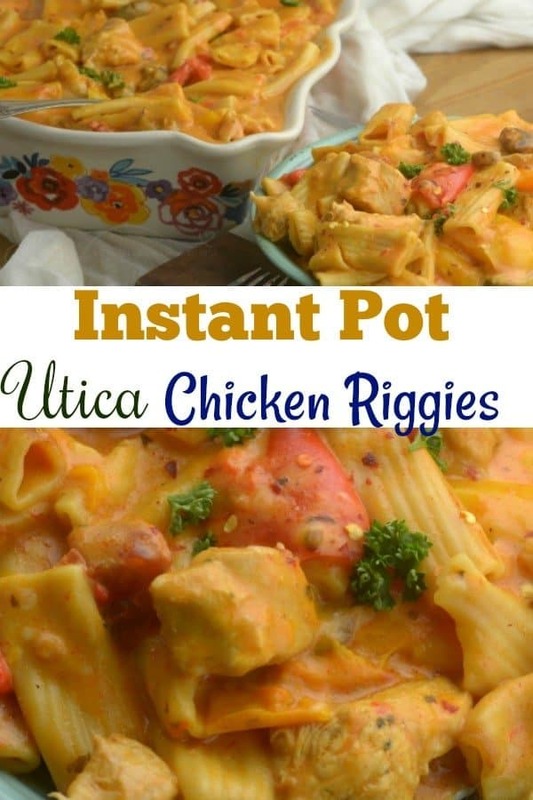 I wanted to make this as simple as possible so you can have Instant Pot Utica Chicken Riggies as fast as possible without losing any of the flavors. More Italian Dishes Done Right in the Instant Pot are my Instant Pot Olive Garden Copy Cat Chicken Scampi, Instant Pot Pasta Carbonara and, Instant Pot Homemade Lasagna Hamburger Helper. 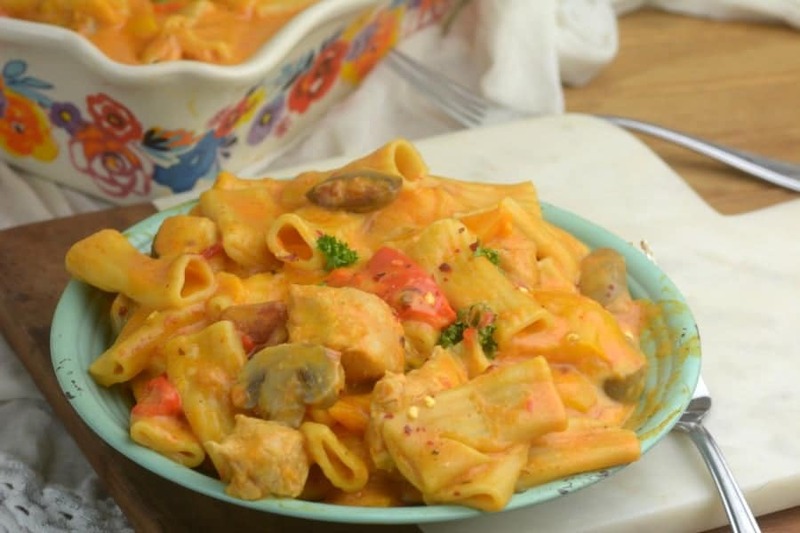 Chicken Riggies has Tender Chicken and a Creamy Cheese sauce, Sweet Peppers, and a Spicy Hot kick of Red Cherry Peppers. This looks amazing! I think we figured out what is for dinner tonight. Two questions, when do you add the marinara? What kind of romano cheese do you use? Thanks! I really want to try this but I’m wondering if a tbs of each seasoning is too much? 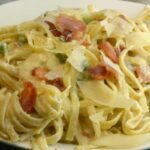 I’ve been searching for a good recipe since I moved to Sacramento from Syracuse (actually Liverpool). Thank you! Two questions: What do you do differently on the stove? And do you have a recipe for Utica Greens? They go perfectly with some riggies. Thanks! Can’t wait to try these with some yummy Utica Greens. I grew up in Utica. This looks tasty. I do remember all the great Italian food. I’ve never used a red hot cherry pepper, would I get them in the fresh produce section? Also how spicy is this dish? My husband is a baby with heat. We absolutely loved this dish. I didn’t add the cherry peppers and we thought it still had plenty of kick! 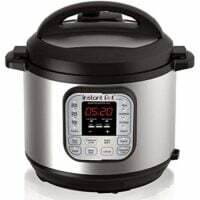 It just took my IP forever to come to temp so I would definitely allow 15 minutes or heat your water and sauce in advance. Thanks! I grew up on McGills riggies…. these taste very similar, in fact, they’re better! I dislike the riggies that some restaurants have that are more tomato based. This sauce comes out so creamy! This will be my go to recipe. Only thing I did differently was cooked the rigatoni separately on the stove, diced a onion and minced garlic instead of the powders. Absolute perfection! I grew up near Utica. Transplanted to NC 20+ years ago. I haven’t had chicken riggies in years! Gonna be making some next week. Thanks for sharing!! Fyi, My local supermarket sells “It’s A Utica Thing” sauces. One is Chicken Riggie Sauce in a 24 oz. jar. Nutrition Facts are reasonable re: carbs and sugars. Sodium is little high, 654mg for 1/2 Cups.